The Asturian rivers that descend from the Picos de Europa, the mountain range along the coast of northern Spain, to the Bay of Biscay were once plentiful with wild salmon. Although today the catch is much reduced, Asturian salmon is still considered the best in Spain. Asturians cook salmon in many different ways, but salmon baked with cider, a staple of Asturian gastronomy, is arguably the most representative. 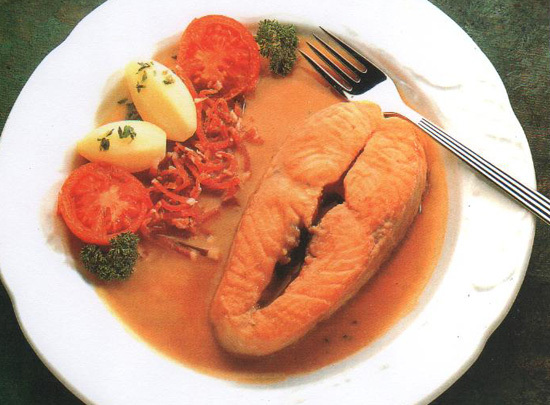 Though the usual cut for this recipe is salmon steaks, I often prepare it with fillets instead. Preheat the oven to 400 ° F. Select a roasting pan large enough to accommodate the salmon in a single layer. Season the salmon on both sides with salt. In a large skillet, heat the olive oil over high heat. Add 2 salmon fillets and sear for 2 minutes on each side, or until golden. Transfer to a plate, rub both sides of each fillet with butter, and then place in the roasting pan. Repeat with the remaining fillets. Pour the cider over the salmon and bake for 15 minutes, or until opaque throughout when tested with a knife tip. Sprinkle with the parsley and serve immediately with the potatoes. Green Aparaguses with Salmon: This innovative tapa recipe puts together traditional Spanish ingredients with northern salmon... Try this new classic tapa!